Today, I have the pleasure of posting a quick demo clip from Jeff Hein. 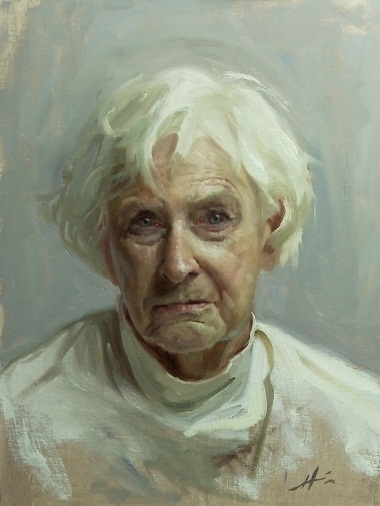 He painted Joanne, one of his students, from life. He has been in the long tedious process of editing the full length video. I believe 4 cameras were used at the same time to get simultaneous shots and close-ups. The painting took him about 3-4 hours to paint, and a couple more to set up the cameras, lighting, and make sure everything had good color balance and clear views. Countless more hours will be spent on editing all of the camera views for the final video. He started out this demo a little differently than the other demo video posted on this blog. The other clip shows him starting from the inside of the face and working outward, slowly revealing the face structure color by color. In this demo, Jeff started Joanne’s face very loosely in a pattern of shadow and light planes. He explained, that this way of painting felt almost sculptural in nature, as you slowly refine and resolve the face to the clarity you are wanting in the final composition, by building as a whole slowly. Jeff was telling me that from the very beginning he is thinking of his cools and warms on the figure, in what relationship to the other colors they are, and in what abstract shapes. I noticed that as Joanne became more resolved, Jeff’s brush strokes grew smaller and more concise. Finally, we have the finished, beautiful and very sculptural painting for this demo of Joanne, by Jeff Hein. Enjoy the quick (and silent) clip! This entry was posted in News, Process and tagged art, art classes in Utah, art instruction in utah, base layer in painting, demo painting, Fine art, Hein Academy of Art, jeff hein, oil painting, painting, Painting from life, Salt Lake City, Utah Art. Bookmark the permalink. brilliant post! looking forward to seeing the full video of this demo. and thank you for the clarification posted yesterday, it all makes sense now. It is really interesting to see the process! Have you thought about doing a time lapse? Will this be available to by as a DVD in the near future? I will be wanting a copy of this. Amazing work, and an amazing blog. It absolutely will be. thank you.